To me, inspiration is probably one of the greatest gifts you can give to anybody. If it wasn’t for inspiration, we wouldn’t be living in the world we live in today. I think it’s safe to say that all of our greatest leaders, inventors, heroes, etc. were inspired by someone or something, right? For example, Gandhi inspired Martin Luther King Jr., Steve Jobs was inspired by the co-founder of Polaroid, Edwin Land, Elon Musk was inspired by the Lord of the Rings, and the list goes on. When you strive to be the best version of yourself, just know that there is someone out there who will be inspired by you. And this is a gift you give not only to yourself, to the person you inspire, but also to the world. Inspiration leads to great things. Inspiration leads to movements, inventions, improvements, art, and whatever else can be inspired. If you follow me on instagram or on my blog, I’m sure you’ve gotten the gist that I love to travel. I kind of feel good about myself when my friends or other random people tell me that I inspire them. If I can inspire others from a picture alone to go visit somewhere, or take a solo trip, or do something they’ve always wanted to do, then I’m happy. That’s the beauty of photography isn’t it? So when you combine photography and social media (Instagram), you basically have a powerful outlet or tool at your fingertips that can be used to inspire an endless amount of people. This is why I am picky about who I actually follow now on Instagram. I mean, don’t get me wrong, I do have some guilty pleasures, but I have a general theme of people and accounts I follow. I love to travel, nature and being outdoors so I follow many “Instagrammers” who post pictures in this area, but I especially love the ones who also promote positivity as well. Or the ones who post with a genuine purpose to inspire others. And for the most part, you can tell the ones who are genuine, and the ones who are trying to make a dollar. Or at least I’ve told myself that. Anyway, I’m not sure where I’m going with this post, but I just wanted to remind you that when you do things you love or when you try to be the best version of you, you will indeed inspire others and this is something we should all strive for! 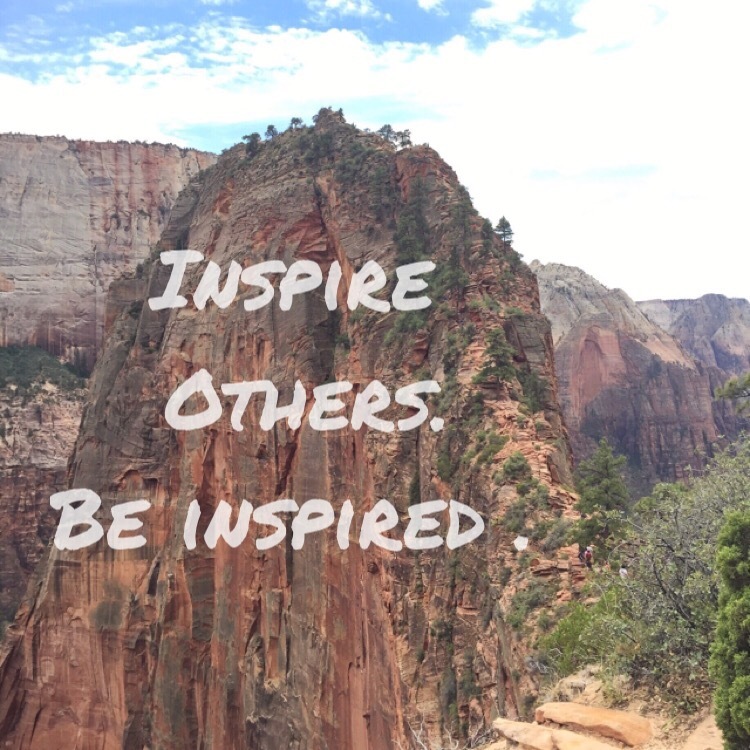 Who or what inspires you? Currently, I’m reading Wild by Cheryl Strayed so I’ve definitely been inspired by her story and the journey she went through. I am also always inspired by solo female travelers because it takes a lot of courage to go out there alone, against your fears and people’s judgments. Share your inspirations with me because I would love to hear about them! Let’s inspire and be inspired. Hope everyone is having an amazing week.